It's been almost a year since I blogged. And probably almost that long since I read blogs. It's not that I don't care, I just have felt like blogging was a waste of my time. I don't post a lot of pictures. I don't want any advertisements cluttering up my blog as I never meant for it to be a business. If I had something to offer, great, I hope you appreciated it. If not, well, my blog initially was for me anyway. So what's happened in a year.... Spent Christmas in Florida with my sister and her husband. Had a total knee replacement in January. I was prepared for pain which, fortunately was minimal. I was not prepared for loss of energy. Took almost 4 months to get it back. Yes, I have made quilts. I do stay busy on that front. This spring I discovered I enjoyed making Fairy Gardens and broken pot gardens - I should have stayed off Pinterest - way too many ideas. I am gearing up for Christmas already and also have a couple big projects I will be working on. Life is good and I am blessed. Will I be back often, probably not... But just thought I would pop in here and let those few who care know I have not fallen off the face of the earth. June 4th was my last post - looking like I'm only doing this every 3 months or so.. I seem to be doing more quilting for QFC than actually working on my own projects..... I came home from Sew Fest this year thinking I only had two that I had assembled to quilt and finish and then someone who volunteered fell through and I ended up with 5 more. 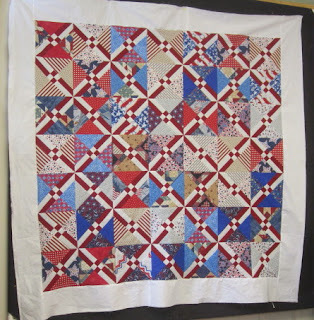 On top of that, I already had 8 to quilt for the Senior's Center quilt ladies. Now I still have 5 more of my own that are 'in waiting' and have been for quite some time. Do you do that? Find yourself working more on things for others than you do yourself? these are the quilts I got done at Sew Fest. I really like the 4-patch lattice (bottom) and have some fabric that I will probably make one for myself with. Just a lot of bias edges, so need to remember to starch a bit heavier. Yep, been since February since I posted. I did not fall off the face of the earth (obviously) and I guess I've been busy, but sometimes I wonder with what. 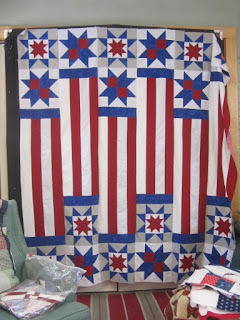 I have not done a lot of quilting or piecing. I guess it's more a little here and a little there. 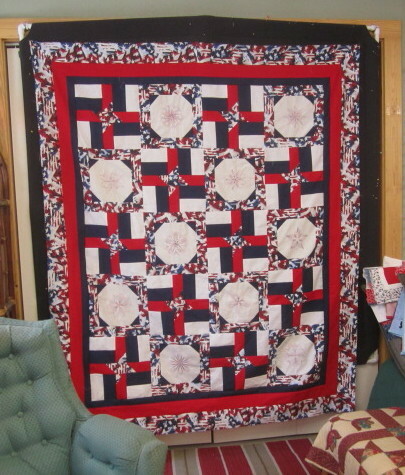 Quilters for Comfort has slowed down a great deal. Surprisingly, we don't have members coming forward with organizations to donate quilts to. Our annual Sew Fest will be held in Oklahoma this year and we have two different veteran organizations that will be the recipients of those quilts. This quilt was made for one of the QFC members who underwent extensive shoulder surgery and is now doing physical therapy. Whenever we know one of our members are facing a challenge, we try to make sure they get a quilt. The designs are fairies and I believe they are from Ace Points..
Then I did take a break from fabric anything and did these arrangements in tea cups. I had seen the 'floating tea cup' arrangements on Pinterest and knew I had to try them. It really wasn't that easy to find nice pretty tea cups with matching saucers that weren't part of a set! But I found these and they are so pretty. I really enjoyed making them and would like to make more, but not sure who I would gift them to.. So anyway, there's a little of what I've doing. My daughter-in-law graduated with honors from the University of Arizona this May so my babysitting (for now) has slowed down drastically. She's planning on taking a year off from school and then heading back to get her Masters and ultimately her doctorate. I admire her determination to go after what she wants. Just not sure I will keep this blog account much longer. I obviously have posted very little for, actually, a few years now. I find that my passion for quilting is just not there anymore. I've thought maybe it was because I've become too steeped in the charity participation. My group also is not as active as it used to be and I think there are several reasons for that and the first being the fact that mailing costs are so high and most of our donations are being sent out (not overseas, but to other states. This group has members all over the U.S. and donate accordingly). If I have a specific project, I get in and get it done but for the most part I have to force myself into the sewing room. Once I get in there, I find I sew maybe an hour and I'm wanting to be done. I decided I needed to finish up some projects. Most were tops just needing to be quilted. I am really having a time even getting that done! Arizona has had some cold, dreary, overcast days and I think it's getting to me - I really want my sun shine back! Anyway, hope everyone had a nice Christmas and a nice start to the New Year. It's been over 2 months since I posted anything.... Been busy with quite a few different things. My favorite brother-in-law passed suddenly on October 28. Sure took the wind out of our sails. I went down to where he lived (3 hrs from us) to help his daughter go through the house trying to find any papers she needed as she's his only heir. ( His wife passed 6 years ago...) Anyway, had to come home as I was scheduled for a MRI that I felt I really needed to get done. Was heading out the door when my phone rang and it was my sister informing me that we had lost my brother on Nov. 1st. Again, very sudden. As hard as this hit me, I am so very thankful that these men I loved so much did not suffer from long, drawn out illnesses. As for my MRI, I've been given a diagnosis of arthritis and stenosis in my back. The doctor tried a couple injections in my back which helped for about 4 days - guess this is something I will simply have to learn to live with. I don't read blogs every day and anyone who follows me know I certainly don't write / post every day or even every week for that matter. I post when I feel like there is something I want to share..